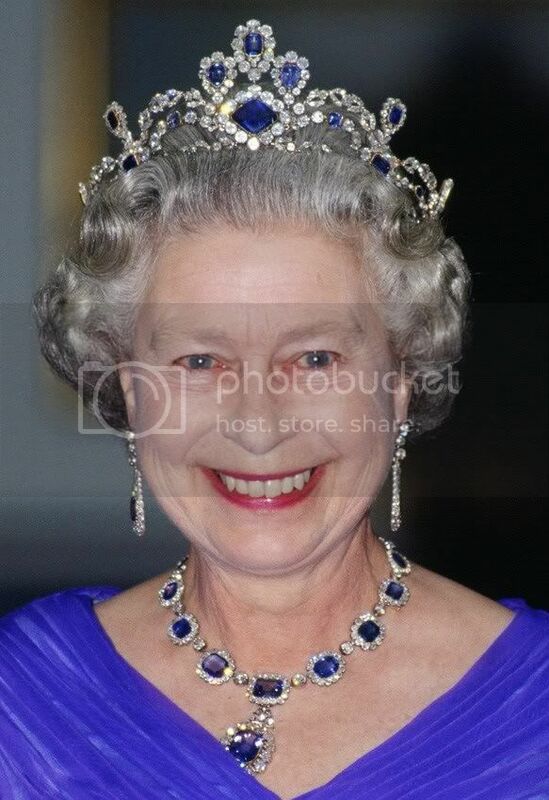 Queen Elizabeth has soooooooooooooooooo many jewells I am sooooo jealous. 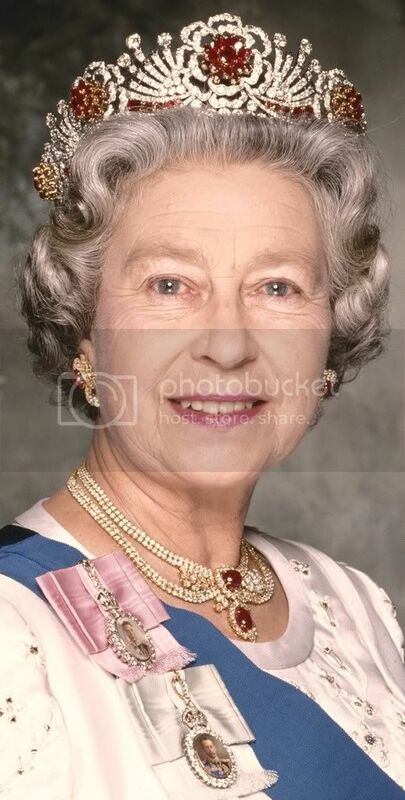 One of Queen Elizabeth’s favourite pieces of jewellery is the Girls of Great Britain and Ireland Tiara which is also referred to as “Granny’s Tiara”. 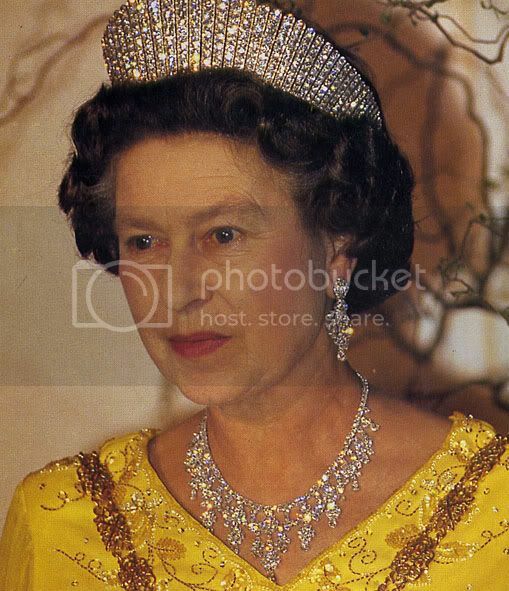 It was a wedding gift to Elizabeth by her devoted grandmother Queen Mary in 1947 along with a number of other pieces. 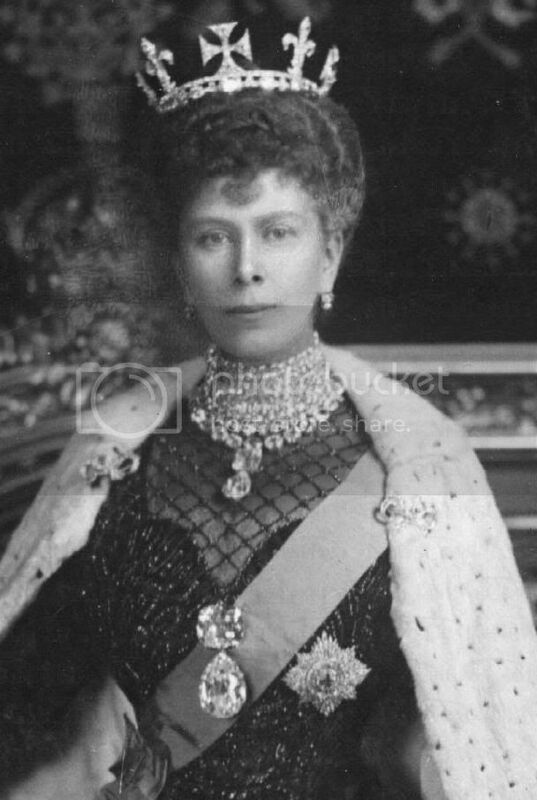 However the tiara had originally been given to Princess Mary of Teck (later Queen Mary) as a wedding present in 1893 by a committee started by Lady Eve Greville. 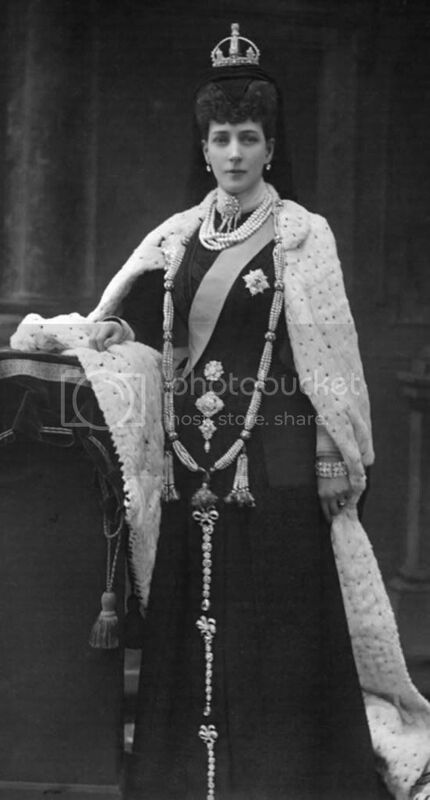 The circle of brilliant-cut diamonds mounted in gold and set in platinum was made by Garrards in 1911 and Queen Mary wore it in Delhi to mark the start of King George V's reign as King and Emperor of India. It was lent to the Queen Mother for her visit to South Africa and remained with her but she is not believed to have worn it subsequently. 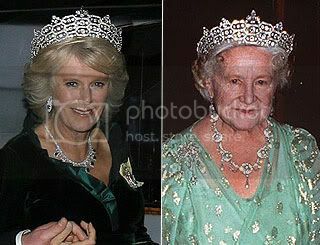 The tiara previously included five of the Cambridge cabochon emeralds and also was occasionally worn with two diamonds from the Cullinan stone. 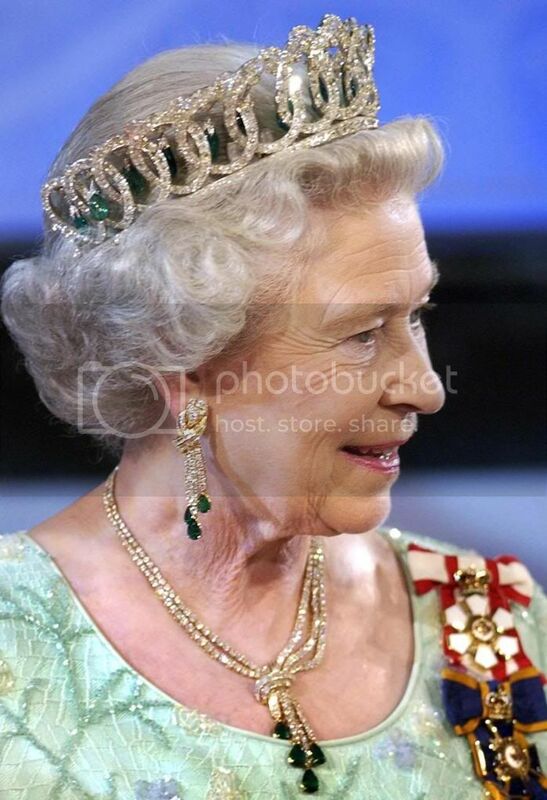 But the emeralds were removed by Queen Mary and made into another tiara now owned by the Queen - the diamonds were kept separately as a brooch. 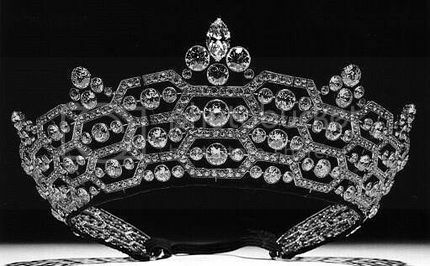 It was one of a handful of tiaras that the Queen Mother wore after she was married but before she ascended the throne in 1937. 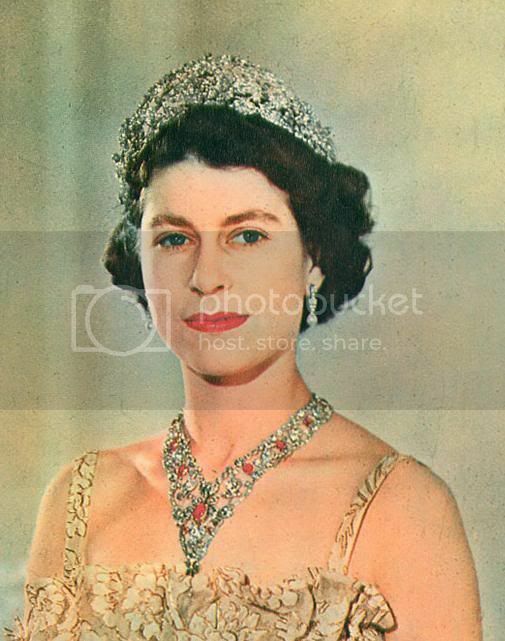 As far as I know only Queen Elizabeth’s younger sister, Princess Margaret used to wear her mother’s elegant headpiece in a state banquet at Buckingham Palace in 1954. Nearly 20 years later, Princess Anne wore it for her visit to Australia and New Zealand in 1970. Given to Princess Louise of Wales (daughter of KIng Edward VII and Queen Alexandra) on her marriage by her husband the Duke of Fife. I'm more than sure that Kate is already looking at these jewels and rubbing her greedy hands in glee, while Carole and Pippa pick out what they want to wear. One day she will though, won't she. That's the sick part. The Fife is not part of the vaults anymore although that piece is incredibly beautiful. I love the BRF jewels much more than the jewels from the other RFs especially because we don't really know what their vaults have. I wish we would know what is in their vaults. 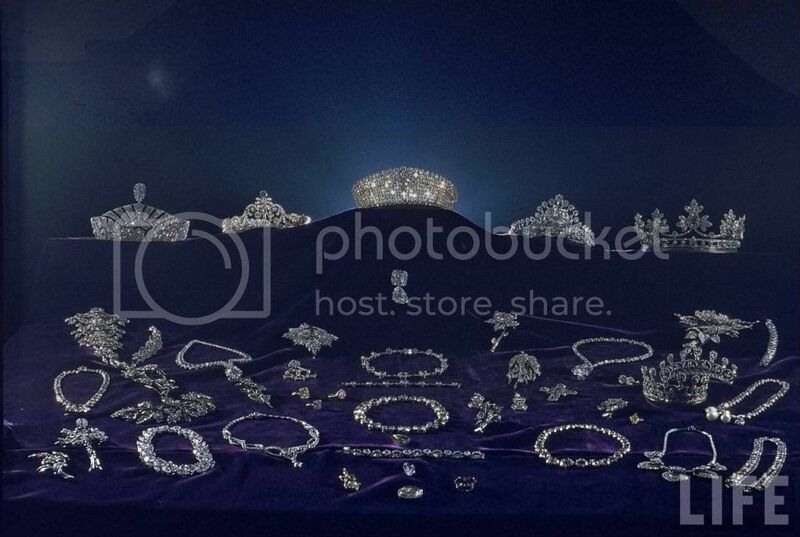 There are so many tiaras and diamonds that haven't seen the light of day for a century. 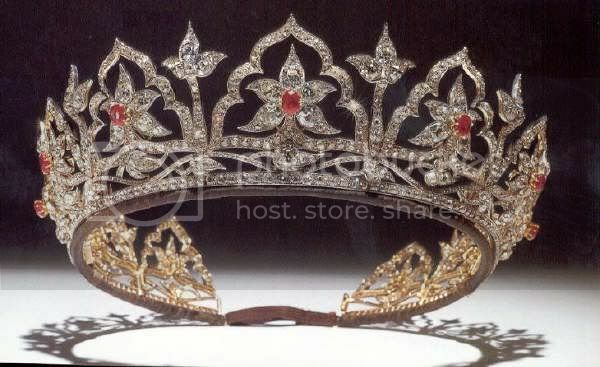 There was a rumor that this diadem was used to create the Burmese Rubin Diadem (see below). However no official information was released by the palace. 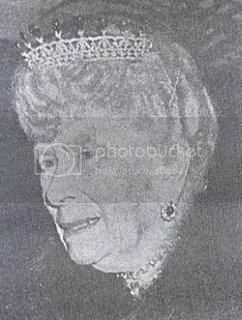 The Queen hasn't worn the tiara publicly since about the early 1952. 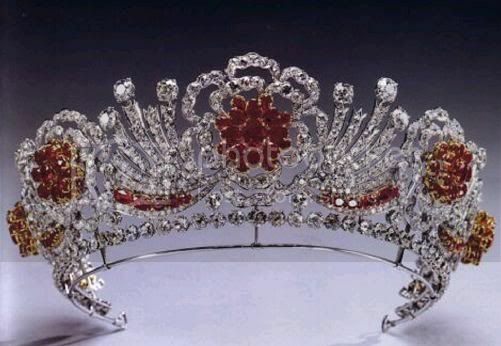 Leslie Field says in The Queen's Jewels about the Burmese ruby tiara's creation: "The diamonds came from a tiara the Queen had been given as a wedding gift by the Nizam of Hyderabad and Berar." (p.69, 1987 ed.) This statement is the main source of the dismantling rumors. 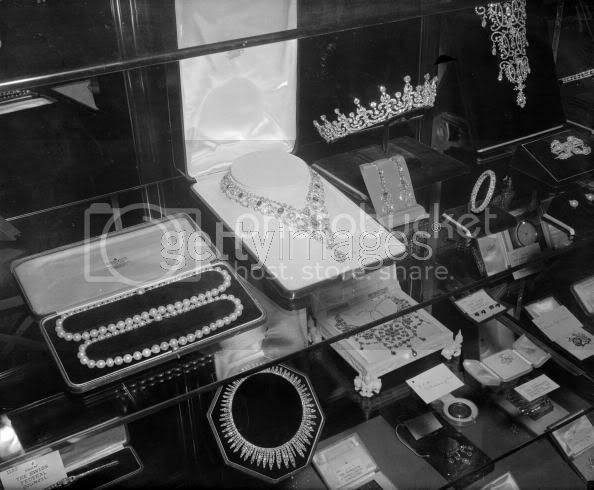 In honor of the 60th wedding anniversary of the Queen and Prince Philip, Buckingham Palace's 2007 summer exhibition included a selection of wedding gifts. On display: the necklace, but not the tiara. Indeed, no mention of the tiara was made. 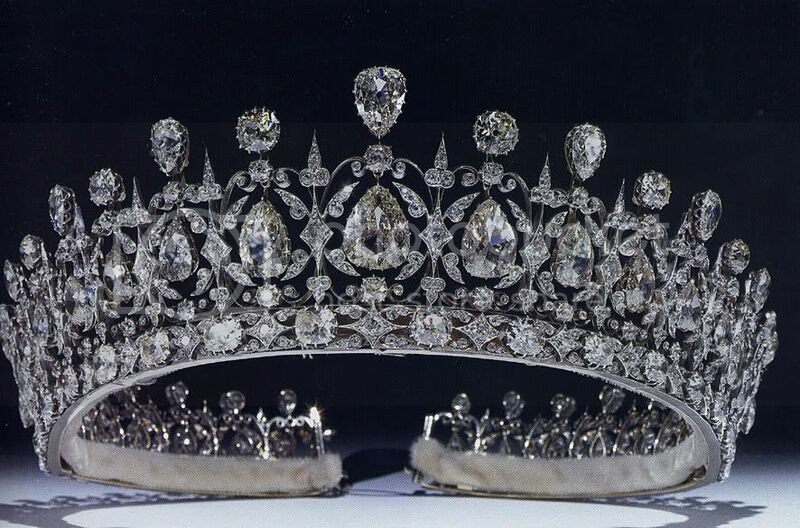 The Boucheron tiara was left to Queen Elizabeth the Queen Mother by the Hon. Mrs Greville from Boucheron in London on 8th January, 1921. Given to Princess Louise of Wales below (daughter of KIng Edward VII and Queen Alexandra) on her marriage by her husband the Duke of Fife. 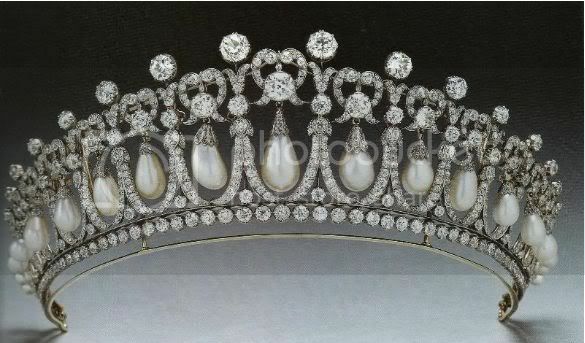 The Fife is one of the most amazing tiaras ever! But doesn't belong to the BRF and never did. Despite being owned by Princess Louise, it belongs to her husband's family. KUEI FEI - The sight of KM wearing ANY of Queen Mary's tiaras and other jewellery will come second only to the sight of them on the balcony of Buckingham Palace that will churn up my stomach, and send me in despair to the Republicans. Even worse would be the knowledge that Carole and Pippa are trying them on and parading around inside the palace. I don't think they would dare attempt to wear them outside in public. I don't think that would be allowed no matter how much Willy kicks up a fuss on behalf of his beloved surrogate family. 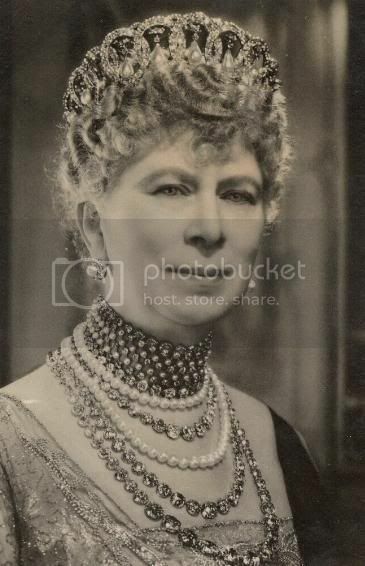 I read quite recently that on her return from her hols, HMQ closeted herself with an aide Angela Kelly and a courtier and they were assisting her in cataloging the jewels. 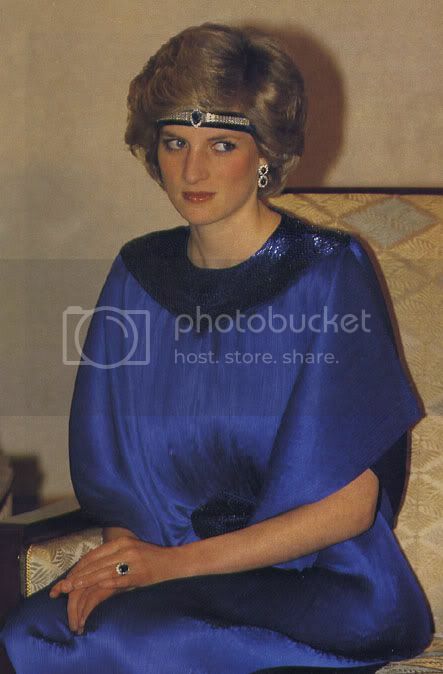 This work has now been transferred to a special file online, available only to the royals, so they can be seen and identified at a glance, and kept track of. On a Royal Jewels Message Board photographs of all the tiaras were reproduced in colour and a quiz was held, or actually two. One was a quiz to choose what members thought would be a "gift" for her to wear at functions, and one was a bridal tiara to wear on the day of her wedding (ugh). 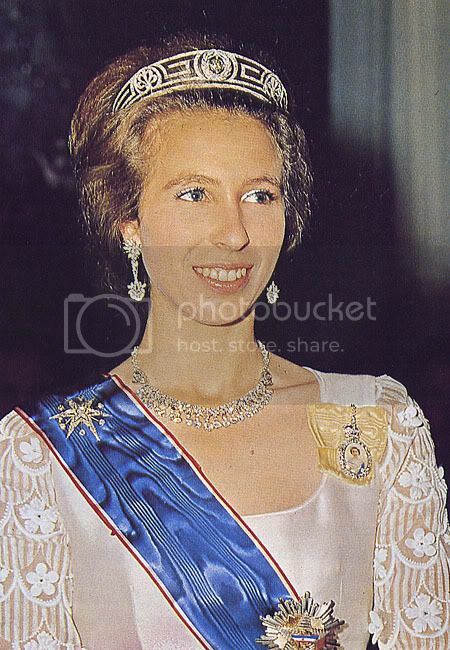 The Strathmore tiara was, I think the winner with the fringe tiara running it a close second, but I doubt that that would be used because it is for the women of the RF, who are born to it, HMQ, Princess Anne, which is why I hope Zara will wear it and continue the tradition. It would suit her IMO. 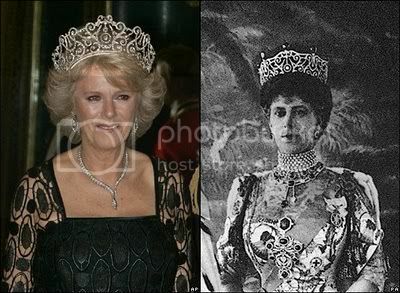 As a matter of interest Charles like to keep all the jewels of the QM so that Camilla can enjoy that association. I doubt he would be happy for KM to share that treasure trove and its association. 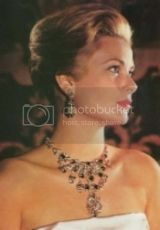 Here she is using the Cullinan I and II as brooch and the Cullinan III and IV attached to the necklace. 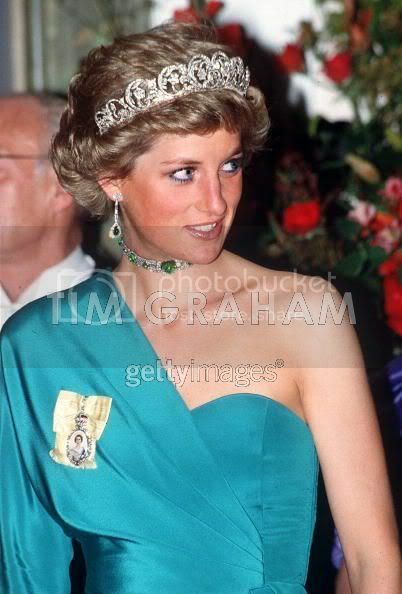 The brooch made by the the Cullinan III and IV is the most valuable item that QEII has. 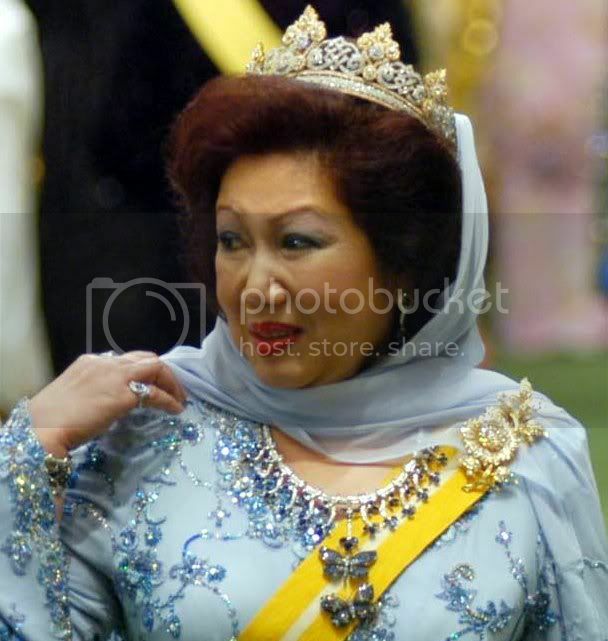 Look at the Queen of Malaysia! I think she is wearing the rundell tiara or not??? 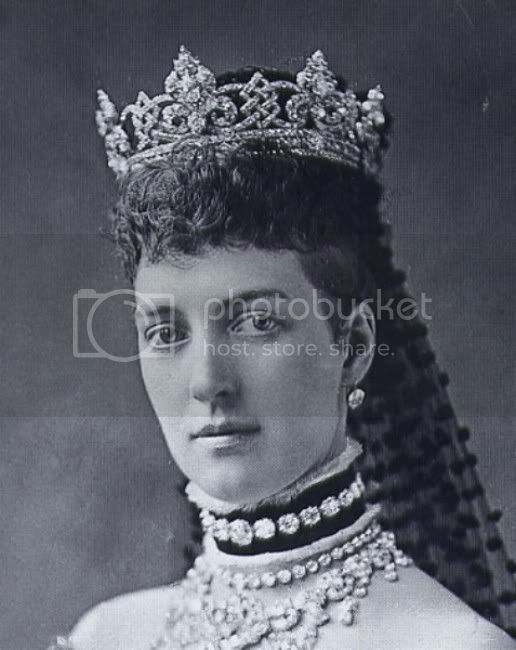 It is missing since Queen Alexandra died -because of the lack of a testament. It is a tiara with papyrus-shaped mounts framed in scrolls separated with palmettes. The diamond trails arch above, surmounted by diamonds and a pearl. 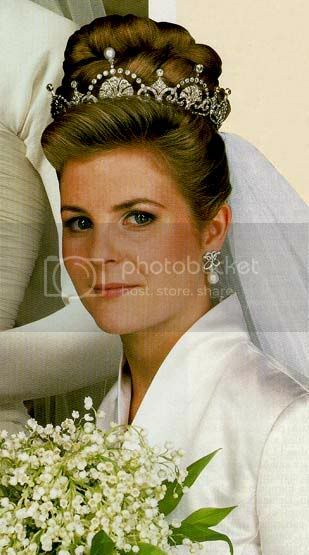 Serena Stanhope wore it at her wedding with Viscount Linley, the son of the late Princess Margaret, Countess of Snowdon. 52. 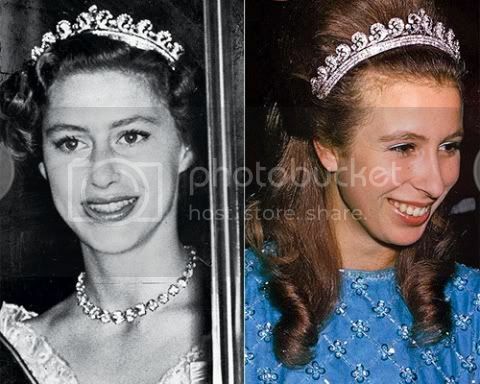 Queen Elizabeth’s two -hidden Sapphire tiaras. 61. 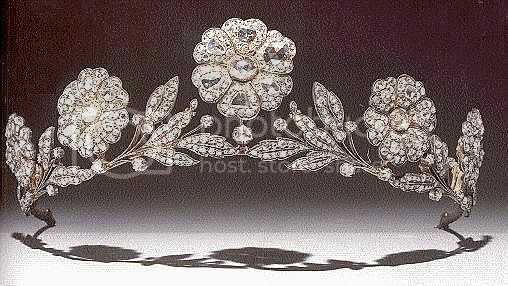 Princess Mary’s Diamond scroll and cluster circlet. That's a VERY loooooooooooong list! 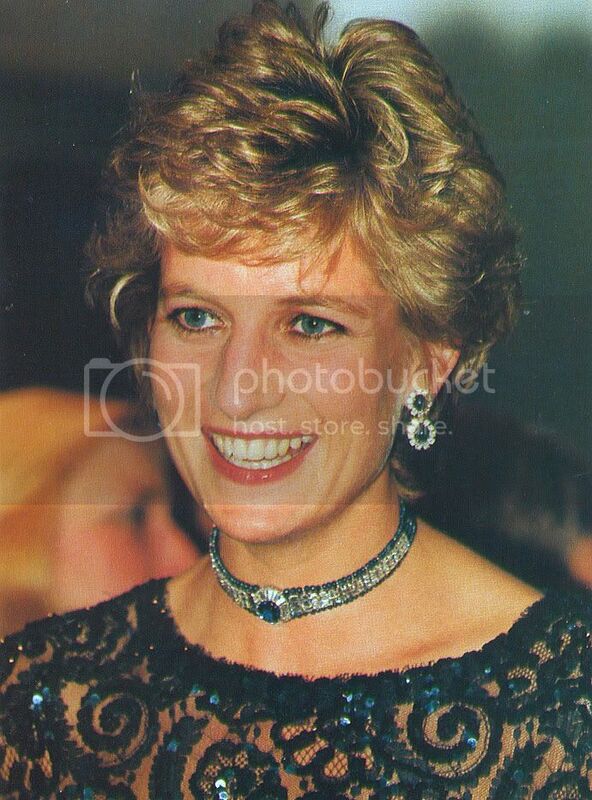 Thanks for pics.She had wonderful jewels. 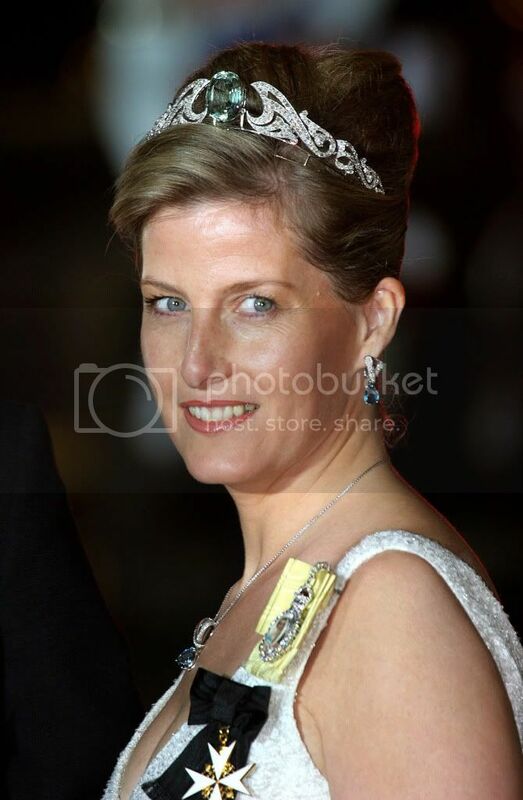 As a tiara Princess Kent is wearing I think the diamond daisies from Marina, put together in her hair. I love the necklace she's wearing! Sofie Wessex in her wedding tiara and..... what order is that? 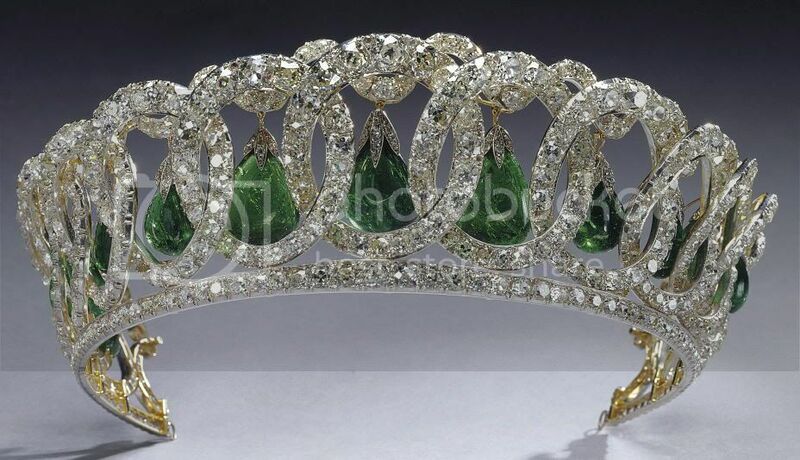 Found a loveley pic of the Hartcourt emerald an diamond tiara, which was sold apparently. It's not a royal piece exactly but it's sooo lovely! 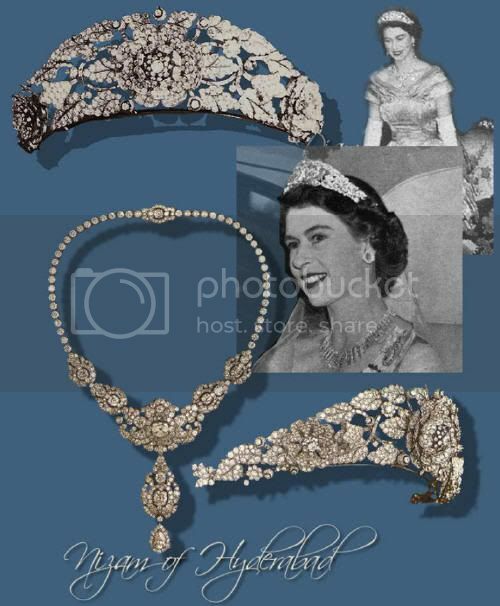 A magnificent tiara worn at the coronation of both King George VI in 1937 and Her Majesty Queen Elizabeth II in 1953. 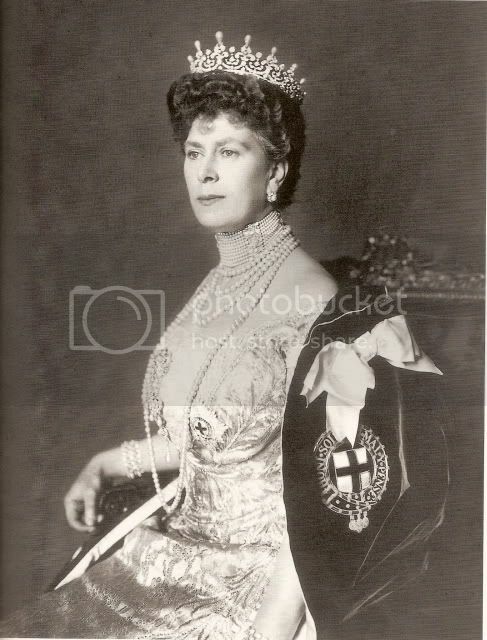 The beautiful Harcourt tiara was worn at the 1937 coronation of King George VI by the Dowager Viscountess Harcourt, in the picture above, dressed in her robes for the coronation of George VI with the emerald and diamond tiara on her head and the Harcourt necklace made for her by Cartier in 1920. 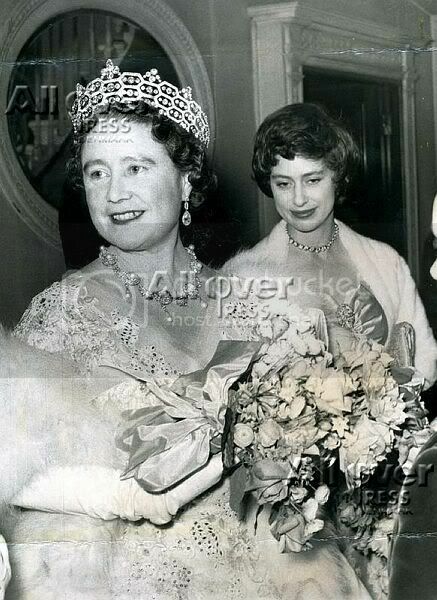 Her daughter, Lady Ashburton, later wore the same tiara at the coronation of Queen Elizabeth II in 1953. Lady Ashburton was the elder sister of William, Second Viscount Harcourt. She married the Hon. Alexander Baring, later sixth Baron Ashburton, in 1924, the father of the present owner. The exquisite tiara is composed of sprays of diamond flowerheads and leaves running between borders of continuous diamond ribbon motifs with the focus centring on seven outstanding emeralds. 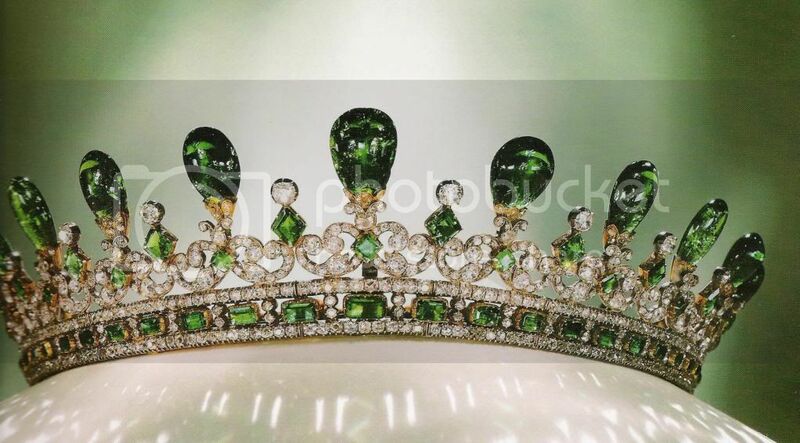 The tiara was worn by the Dowager Viscountess together with the ‘Harcourt Emeralds’ – a magnificent emerald and diamond necklace. The emeralds themselves have a fascinating provenance: they originally descended from Mary Hayes Burns, the sister of the banker J. Pierpont Morgan, to her daughter Mary, who married Lewis, first Viscount Harcourt, in 1899. 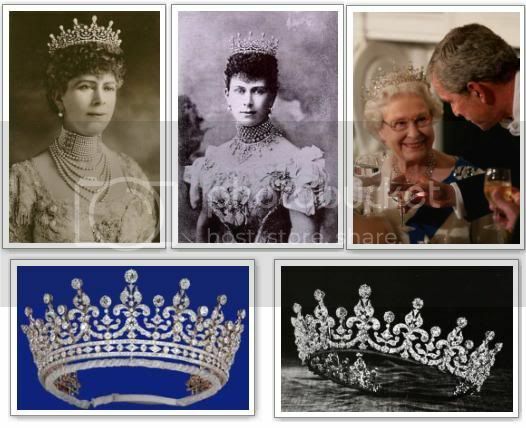 The tiara dates from their wedding. Oh wow those orders are nice indeed! 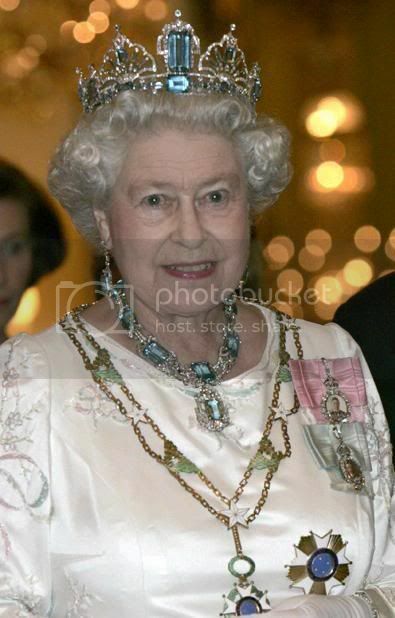 And it's one of the few pieces of big jewellery royal (and other) men can wear nowadays with out looking odd!